Holiday Mappers is a logo of the high quality level orienteering maps. Maps for orienteering and mountainbike orienteering (MTBO) from Holiday Mappers, processed in the standard IOF, have been succesfully used at the national championships, world ranking and national competitions and many other races and orienteering activities. We have 18 years experience. More than 60 mapping projects realized in cooperation with various mapmakers. We manage the mapping projects. We cooperate with Cartographic service (Jiří Daněk), Olles (Aleš Hejna) and the other great persons of the czech mapping scene like Zdeněk Lenhart, Evžen Cigoš, Vlastislav Šebesta, Radovan Čech, Ondřej Kotecký, Zdeněk Sokolář, Petr Mareček, Petr Hranička, Daniel Lebar or Martin Lejsek. Also thanks to one rainy weekend in Norway I have finally added several pages of maps with samples and galleries to my archive: three maps from mapping in Bjugn (NOR) in the last two seasons; four Serbian maps, all issued in this year - 1 of them for Stražilovo cup and 3 for European Youth Championships; and the map Jelenovac, done for Croatian Sprint Championship 2009. See previous news. I was mapping for 3 weeks from July 15th in Norwegian commune Bjugn (4575 inhabitants) with its centre Botngård (1851 in. ), 50km NW from Trondheim - the location of WOC 2010. This time I have mapped mainly sprint map of the Botngård itself (1km²) and in remaining days I was helping to Petr Matula and Tom Novák with the map Blankheia. The mapping took place in cooperation with Aleš Hejna's Olles. Perhaps also because I was already for the 3rd summer in the same place, there haven't been greater surprises. Actually - there was one premiere, but I'm ashamed to admit it a little: as late as at age 38 I've mapped for the first time an interior of speedskating hall. Lying in the bed with a dropping funnel in my left hand I finished the ocad drawing of the map Le Grand Roc for World Cup in Annecy 2010. I have the liver inflammation. It means end of this mapping and running season for me. I 'll be for next two months OFF. All the other mapping projects break down. Next year in May, when the snow melt down, I would like to come back and finish the work. We discussed the possibilities of GPS a lot in the last days. It could help during the construction of the base, but can 't save anybody. It is still not exact enough. The mistake is much more then 3m as Coti said and it is unpredictable. The spring tests of GPS with SiRF III made by the best czech mapmakers confirmed this clear. It is simple-complicated terrain needs the time. Mapping with the legend is a great experience every time. There is nine years left I've been mapping with Evzen Cigos in Austria for the first time. I was really glad to invite Evzen to the cooperation on this project, together with Zdenek Lenhart, who will join the autumn session. It was a nice mapping in the natural park Pilat again. Thanks to Benoit and Nathalie from Gite Les Chaumasses and also Genevieve from Marianne for a nice stay and wonderful kitchen and Jean Baptiste for the organizing. 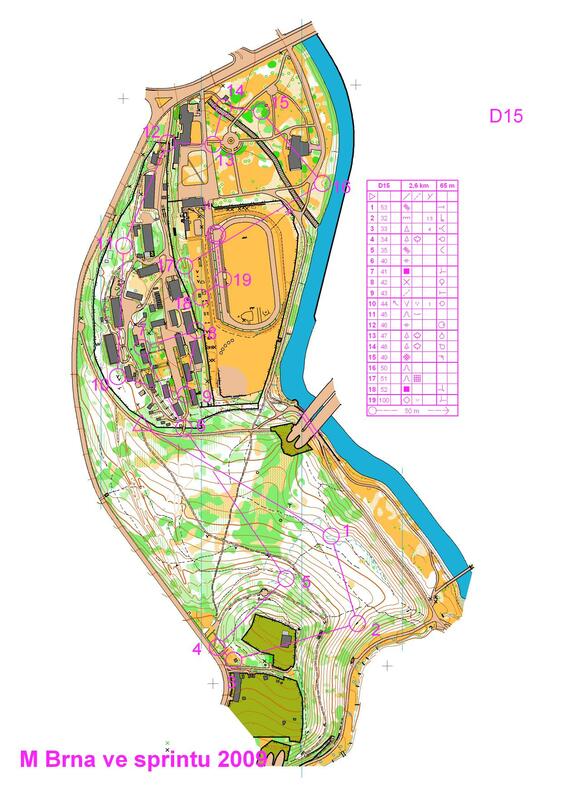 On this Saturday 6th June is going to be foregoing Croatian Middle Distance Championship on the map Lužec-Čistinje. Just a small statistic: on area of 2,5km² we have used 219 pieces of the symbol "Pit" and 718 pieces of the symbol "Small depression." I don't try to sum depressions drawn by contours. Then 13th June Slovenian National Ranking Event on the map Vranja pe (with D. Lebar, M. Lejsek a Z. Sokolář). 20th-21th June Czech Middle Distance Championship on map Katovna (just a little help to Zdeněk Sokolář). 24th-27th June 3 competitions of Spain Schools' Championships (Campeonato de España Escolar de Orientación) on map Navas del Pinar(?) (with Aleš Hejna, Martin Hejna and Bernardo Nanclares). And at the end of the spring season: 3th-5th June European Youth Orienteering Championships (EYOC) is going to be held in mountain resort Kopaonik, Serbia. 3 new maps (with Roman Horký, Robert Miček, Zdeněk Sokolář and Daniel Lebar as a chief mapmaker). I've mapped mainly a map for a sprint race. 9th Sprint Championship of Brno has been traditionally organised by Libor Zřídkaveselý and his club SK Žabovřesky Brno. There was also Czech national qualification for a sprint race at WOC 2009 in Hungary. Winners: Tomáš Dlabaja (ZBM) in men (H15-) and Monika Topinková (PHK) and Eva Juřeníková (MOV) in women (D15-). On event's pages you can see maps with courses (H15, D15). The sprint was arranged on the new map Čertík (in scale 1:4000), which I have been mapped in this spring. Here you can see a layout of the map, including the Holiday Mappers' logo. Olomouc Region's Final of Czech School Championship was held in Prostějov on Thursday 21st May.Club SK Prostějov arranged it on my map Prostějov-Aquapark (1:5000). The map is a cutout of monumental map Prostějov, issued in the last year on occasion of WOC 2008 in Olomouc. I've revised the area and newly mapped only a part with an aquapark, where a competition centre and a finish area were. 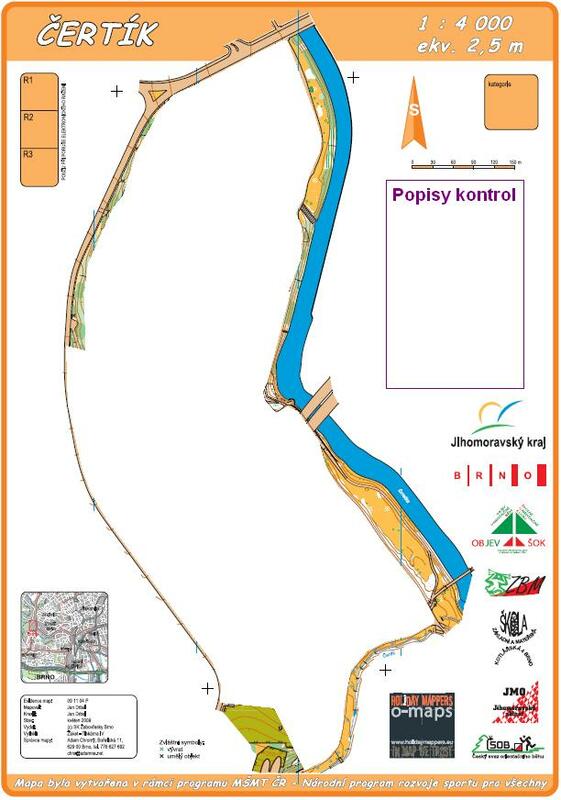 The new map is partially overlapping with area of map Prostějov-Hvězdárna mapped by Petr Hranička, used for Sprint Qualification at WOC 2008. A symbol set used for my map is not that by ISSOM, but it is taken from the original map, we could say "post-PWT". The map was issued as a part of project Tutorial maps. Two-round's "1. Merz sprint" was held as Croatian Championship on Saturday 16th May. Zagreb`s club OK Merz arranged the competition in very green and hilly forest park Jelenovac, just in the capital of Croatia. Results.I've made the map Jelenovac (1:4000) together with Osvald Kozák and Zdeněk Liščinský on November 2008. Two local races in one day (a sprint and a middle with chasing start) were held in Norwegian region Sor-Trondelag by club Bjugn IL on Saturday 25th April.The races were arranged on 2 overlapping maps, which I've mapped with Zdeněk Lenhart and in cooperation with Aleš Hejna's Olles. You can find parts of the two maps with courses and routes of the 2nd man in H19-, Øystein Kvaal Østerbø, a member of Norwegian National Team, on his personal web: the sprint, the middle. It was my second mapping for the club Bjugn IL. The third one should be done this year on July. Too many maps and mapping in the last weeks... Well, I'm starting with brief survey of competitions where maps I've participated in were used from my previous post. I will paste separate pages for each of the maps later. Earlier this year, at the end of March, traditional 2-days event Strašilovo Cup was held in Fruška Gora mountain near Novi Sad, the capital of Autonomous Province of Vojvodina (in Serbia). The 1st stage was counted as one of World Ranking Events (WRE). The event is organized by club OK Stražilovo. Also maps done by Czech mapmakers (and mostly from Brno) are traditional - this time Evžen and Petr Cigoš, me (for the 2nd time) and Vlastik Šebesta, who has been mapped in Fruka Gora for the first time already more than 20 years ago.